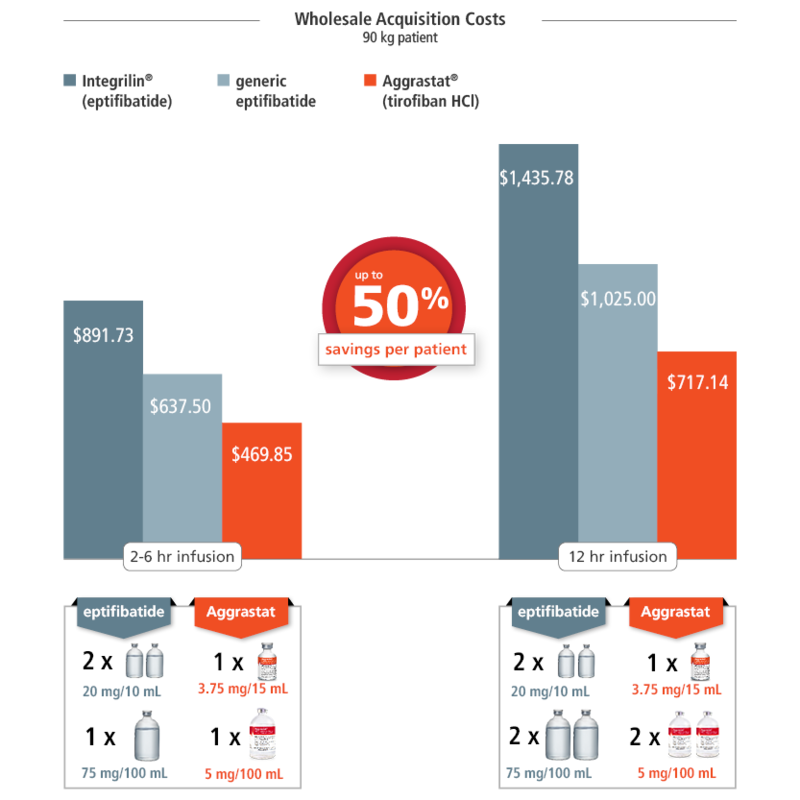 Aggrastat® has the lowest per-patient acquisition costs of any GP IIb/IIIa inhibitor, including generics. Aggrastat® pricing above does not include any discounts. Actual costs are significantly lower due to contract and wholesaler discounts. *WAC=Wholesale acquisition cost. This pricing does not account for any manufacturer discounts or for those hospitals that are able to purchase at PHS 340B pricing for eligible outpatient use. Costs based on shared labeled use of products, according to WAC pricing as of May 2017. Cost of generic eptifibatide based on average WAC. Cost of heparin not included. Costs subject to change and may not reflect actual costs to patients. Cost comparisons do not imply comparable efficacy, safety or product interchangeability. Aggrastat® and Integrilin (eptifibatide) have not been compared in head-to-head clinical trials. A true cost effectiveness analysis compares the costs and financial savings associated with a therapy, including the costs of the therapy itself, side effects, medical/hospital costs, and savings from avoided illness and disability to the health effect of the therapy. This analysis only compares the acquisition costs of the therapies themselves. Learn what your hospital or health system could save by using Aggrastat® HDB.